Odisha, also known as Orissa is a state of East India known for its eclectic history. Every year, the state conducts a class 12 examination along with several other entrance exams for admissions to graduation programs and professional courses. 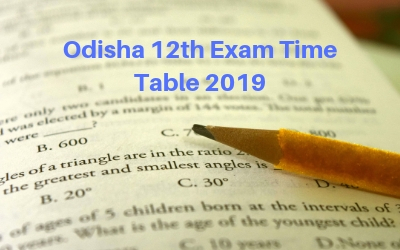 Council of Higher Secondary Education Examination has released the Odisha CHSE +2 exam time table for the year 2019. This CHSE Orissa Exam time table 2019 covers programs for annual higher secondary examination - arts/commerce/science/vocational/distance education. The time table also covers the correspondence course. The CHSE exam is conducted at the state level for class 10+2 students. This is an extremely important exam for class 12 students of Orissa. This exam determines the career path for graduation and professional studies. Students can make use of this Odisha CHSE exam time table 2019 to plan their studies before the exam. Schools can use this CHSE Odisha 2019 time table to conduct preliminary exams and mock tests. To check the detailed or download PDF of Odisha CHSE timetable 2019, please Click here. The CHSE Odisha exam results 2019 will also be announced on this website. Click here to check your result.